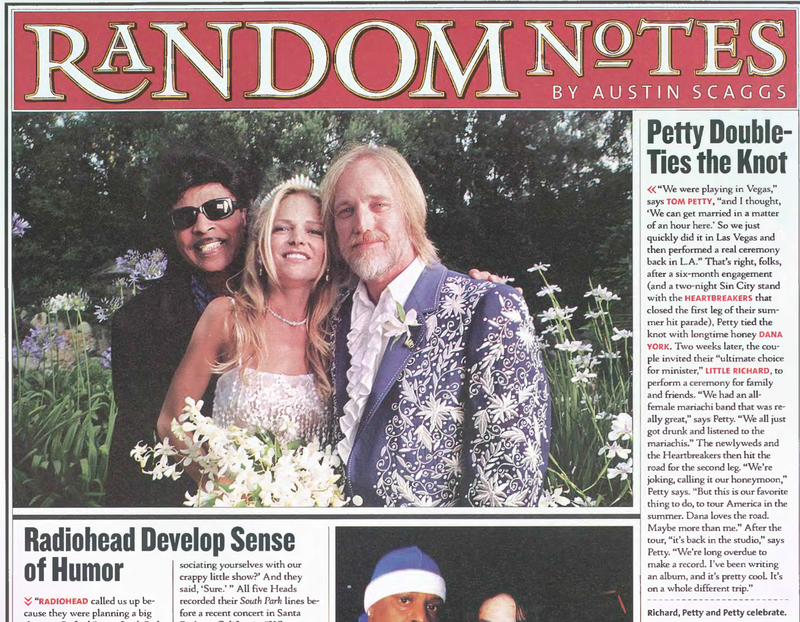 "We were playing in Vegas," says Tom Petty, "and I thought, 'We can get married in a matter of an hour here.' 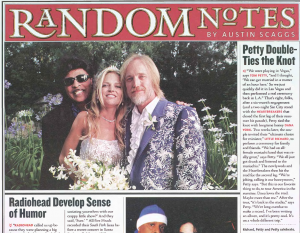 So we just quickly did it in Las Vegas and then performed a real ceremony back in L.A." That's right, folks, after a six-month engagement (and a two-night Sin City stand with the Heartbreakers that closed the first leg of their summer hit parade), Petty tied the knot with longtime honey Dana York. Two weeks later, the couple invited their "ultimate choice for minister," Little Richard, to perform a ceremony for family and friends. "We had an all-female mariachi band that was really great," says Petty. "We all just got drunk and listened to the mariachis." The newlyweds and the Heartbreakers then hit the road for the second leg. "We're joking, calling it out honeymoon," Petty says. "But this is our favorite thing to do, to tour America in the summer. Dana loves the road. Maybe more than me." After the tour, "it's back in the studio," says Petty. "We're long overdue to make a record. I've been writing an album, and it's pretty cool. It's on a whole different trip."